Alberto Moreno decided to miss the birth of his son on Friday evening, so he could stay with Liverpool at the team hotel. Thankfully, Alberto Junior was born in full health and the Spanish left-back put in another tremendous performance in Liverpool’s 3-0 win against Southampton. He must have a very understanding Mrs…! “Alberto Moreno is a father. At 2.30am last night, his wonderful wife (gave birth). 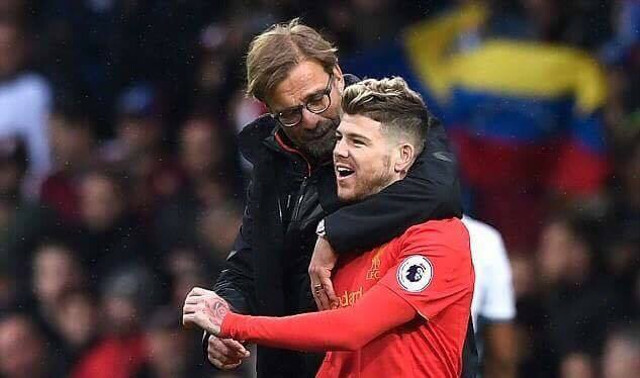 Alberto Junior Moreno was born in Liverpool!” Klopp told the Mirror after the game. It’s been some week for Moreno, who also made his first Spain appearance since 2014 during the international break, which gives him a realistic chance of appearing at next summer’s World Cup. His transformation from zero to hero has been nothing short of extraordinary. Last term, Moreno was frozen out of first-team consideration by Klopp, who not only preferred right-footed James Milner the entire campaign, but signed Andrew Robertson for £10m in the summer. Despite this, Moreno fought for his future during pre-season and earned a spot in the side. He’s been improving ever since and genuinely looks a vital cog in our lineup now. Congratulations on the birth of your new child, and your superb performance, Alberto! Whether in Liverpool or Spain most players run off for the birth or to see the baby as soon as possible. He stayed for the match. Fair play! Wow. Wonder who is more pissed, his wife or Robertson? No one should miss the birth of their children!! Not entirely sure that was a great decision???? Games will come and go…. Nothing is more important than being there for the birth of your child. Never used to hear of footballers missing games coz of babies, plenty of time for that when they retire. Get paid a shitload of money and want time off, I think it would be a frigging cheek!